Weather satellites transformed forecasting in the 1960s. By watching weather systems evolve in real time, meteorologists could predict storms and save lives. But 50 years ago, a nuclear-powered weather satellite threatened disaster. The Nimbus-B, launched on 18 May 1968, was to be the third in its series. The launch went terribly wrong. An installation fault caused the control system to go haywire, and the rocket carrying Nimbus-B veered in the wrong direction. 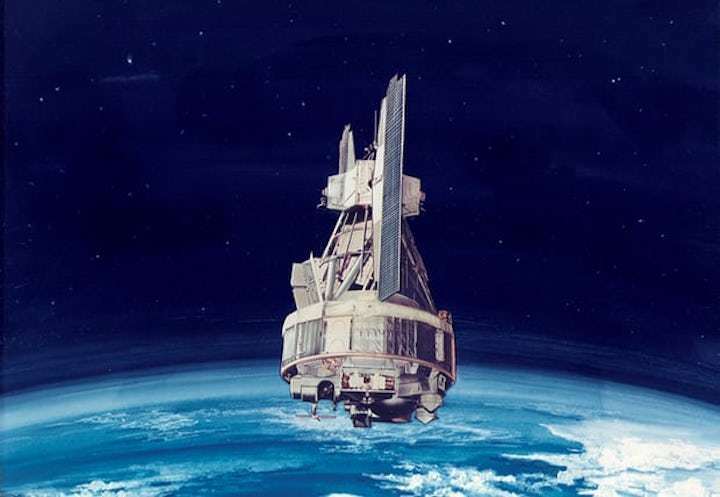 The satellite had nuclear power packs filled with radioactive plutonium; if Nimbus-B broke up in the atmosphere, it could spread contamination over a wide area. Mission control ordered the rocket to self-destruct, and the flight ended after two minutes with Nimbus-B plunging into the Pacific less than 100 miles from Los Angeles. A huge recovery operation was launched to retrieve the dangerous, and extremely valuable, nuclear power packs. Six months later, divers recovered the corroded remains of Nimbus from the sea bed. The intact nuclear power packs were refurbished and launched on Nimbus-3. Modern weather satellites rely purely on solar arrays for their electricity. While there are still occasional launch failures, there is no risk now of radioactive fallout.